This recipe was sent in By Jan Booth who also makes soaps using Seagreens. Check out www.ostrich-oil.co.uk to find out more about her soaps. Follow bread maker instructions and add to the bowl in the given order. This is a medium basic recipe and I set to dark crust. If you don't have a bread maker, combine all the ingredients in a large bowl until the dough has slightly sticky texture. Tip out and knead to stretch the gluten. The dough is ready when it bounces back after being stretched which normally takes around 5 minutes of kneading. Put the dough back in the bowl and cover with oiled cling film in a warm place (airing cupboards are idea) for about 2 hours or until the dough has doubled in size. Preheat the oven to 180 C or Gas Mark 6. 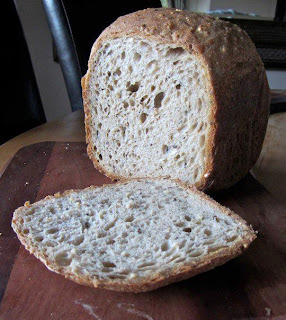 Lightly grease a loaf tin and place the dough in the tin then into the preheated oven for approximately 30 minutes or until the loaf sounds hollow when the bottom is tapped.